Not so long ago the striking stained glass windows overlooking Fourth Avenue were covered with plaster and paint. Today the signal the complete restoration of a structure partially destroyed by fire in 1980. A 25-foot stained-glass dome, built in 1906 for a Northern California Elks Lodge, was installed during the 1982 renovation. A mural along F Street depicts the camaraderie prevalent in taverns of the early 1900s. 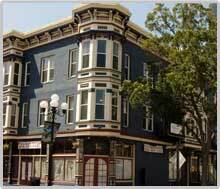 Since its 1981 restoration, this building stands as a Victorian-style landmark. Built by William Llewelyn, the structure house the family shoe store until 1906/ Thereafter, the building was occupied by hotels of several different names, generally of unsavory reputation. In 1917 the proprietors were charged with operating a “cat house”. The charges were dropped after the tenants promised to behave. Still, the illicit activities and bad reputation continued unabated for many years. Prominent attorneys have leased space on the second floor since its earliest days, earning the building its moniker. Although the architecture stems from the Italian Renaissance, the design was influenced by the styles of the decade. Windows were shaped in the form of Roman arches and pilasters contrasted with light-colored stucco walls. In the 1940s an enclosed bridge was built across the ten-foot alley that separates Lawyer’s Block from the adjacent Fifth Avenue Building. This three-story structure was built to replace the landmark Horton’s Hall, which was partially destroyed by fire. Designed for five storerooms and 30 offices, the stone-and-pressed-brick building was constructed for $30,000. 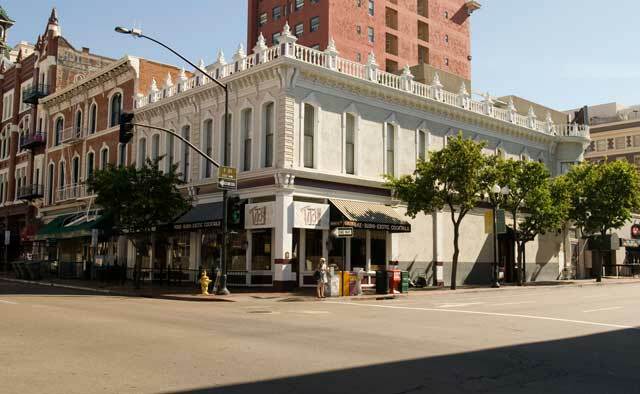 The San Diego State Normal School (now SDSU) leased space on the upper floors in 1898. 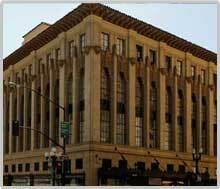 In the 1920’s Ratner Clothing Manufacturing Company was located here which become the largest operating of its kind on the West Coast. 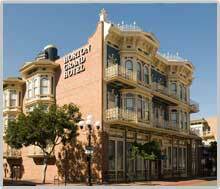 San Diego’s oldest Victorian hotel, originally called the Grand Hotel, was renamed the Hotel Horton in 1907. In 1981 the Horton and the nearby Kahle Saddlery hotels were torn apart and completely restored. In time for their 100th birthday in 1986, the two reopened side by side as one. (The Horton is on the left as you face the entrance.) The facelift restored the oak staircase of the Horton, the stained-glass windows of the Saddlery, and the bay windows of both. 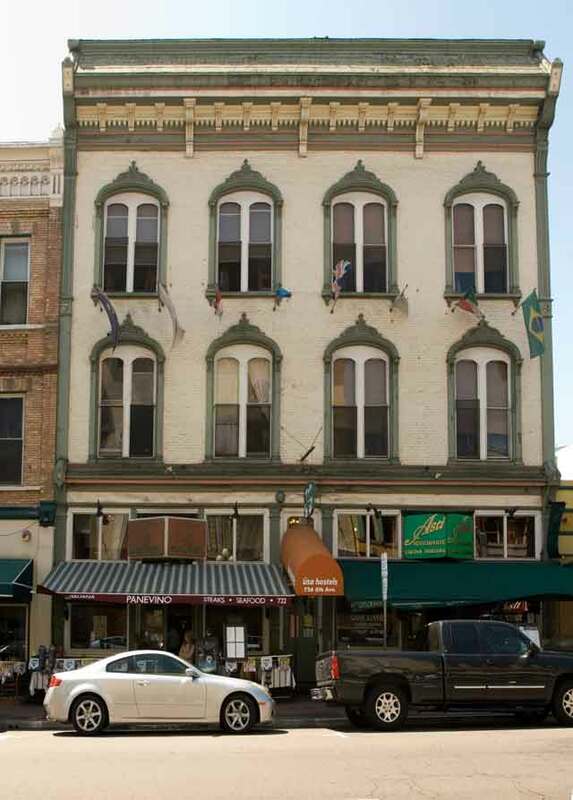 After operating his fledgling retail business for three years in a one-room store, civic leader George Marston moved his operation into this Italianate Victorian style building in 1881. Marston’s Department Store remained at the site for 15 years. 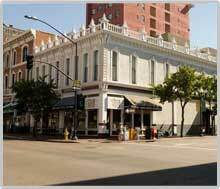 In 1885 San Diego Federal Savings chose the building to accommodate its first office. In 1903, following severe fire damage, the building was extensively remodeled throughout. The Renaissance architecture of these adjacent 25-foot wide, three-story building blends to give the appearance of a single structure. The Fritz Building’s main floor, originally a restaurant, features a large plate-glass front with a vestibule featuring fine onyx and dark Tennessee marble. 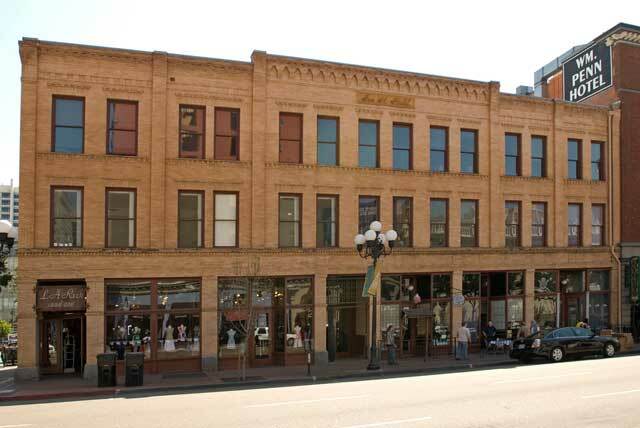 The Denver Bachelor Apartments, for men only, occupied the Fritz Building in 1909 and were later replaced by the Minneapolis Hotel and Restaurant. 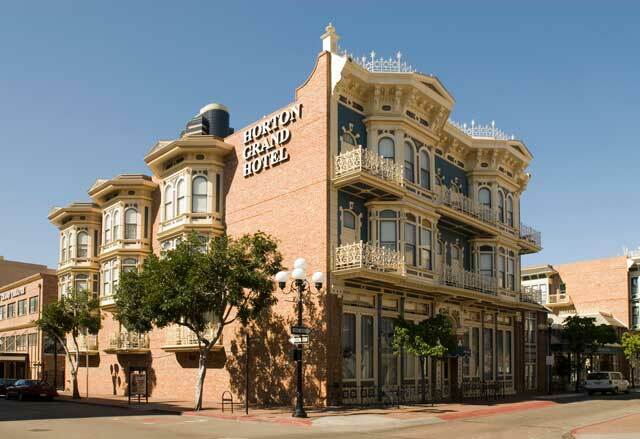 The only Victorian hotel of this era still located on its original site, this three story structure began serving as a home for community relief services in 1901, when the Helping Hand Home moved in. Later the organization evolved into Children’s Hospital of San Diego, which occupied the building until 1920. The structure’s brick-veneered facings, galvanized iron cornices, iron columns, and plate-glass fronts make it one of the most significant Victorian-style buildings in the district. 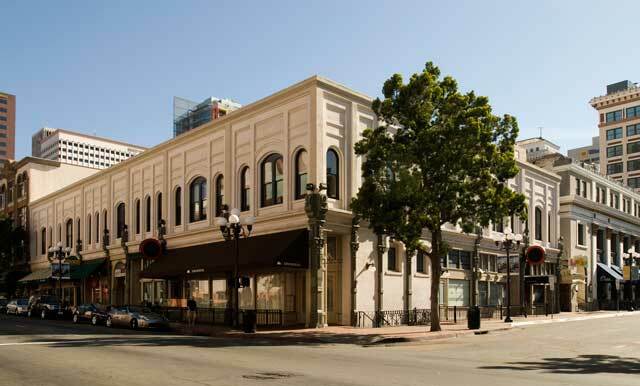 One of downtown’s first brick structures, this building was first owned by Captain Wilcox, who arrived in San Diego in 1849 at the helm of the U.S. Invincible. The ship brought the engineering crew that attempted to turn the San Diego River into False Bay (now known as Mission Bay). The ground floor of the small but beautiful structure has housed a variety of retail establishments. 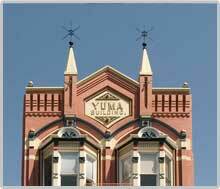 In 1915 the building earned dubious distinction as the first to be closed during a sweep of the redlight district. 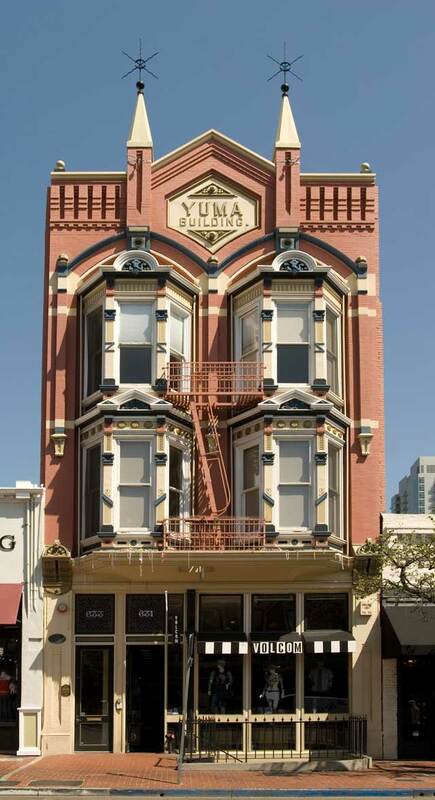 Originally built for $1,900, this single-story building includes cast-iron columns on the front façade. Decorative anchor plate rosettes detail the top of the cast-iron pillars. 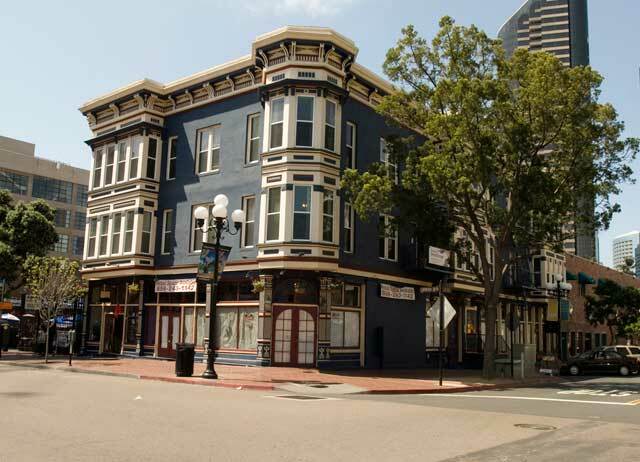 Located in the heart of San Diego’s turn-of-the-century Chinese community, it has housed Asian restaurants since its construction. Thomas Quin operated a Chinese merchandise store in the building for several years; reportedly, only a front for a lucrative gambling parlor in the back. Prior to 1923 this building served as a dance hall and a Woolworth store. 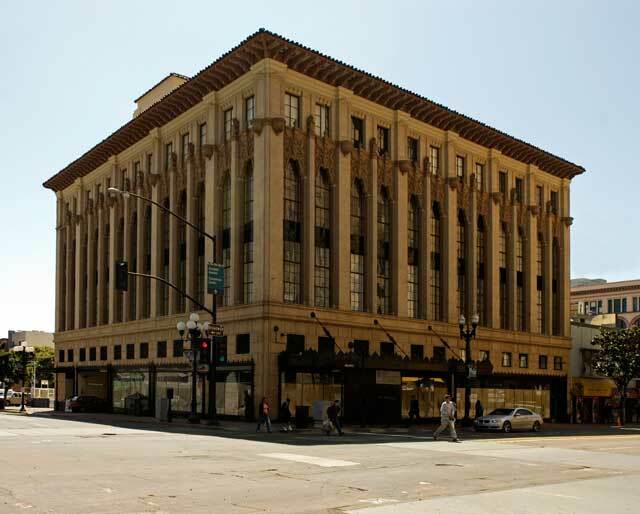 Today the structure retains its original wood floors and rounded storefront windows. Its metal ceilings are also original and are the only ones remaining in the district, the others having been donated to the ware effort as scrap metal. 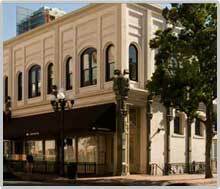 Established in 1892, San Diego Hardware begins its second century of business firmly established in the first floor and basement of the building. Entrepreneur Samuel Fox built this four-story, $500,000 structure to accommodate his Lion Clothing Company, the sole tenant of the building until 1984. Showcasing 16-foot ceilings, antique oak wood paneling, walnut window frames, cast-iron decorative grills, heraldic lions in full relief, sculptured terra cotta spandrels, and an overhanging tile roof, the building was recognized as an artistic masterpiece as well as a merchandising success.